Following invigorating crime fictions parties at Hodder and Stoughton, Quercus, Mulholland & Headline Publishing, as well as Penguin-Random House and Macmillan it was now time to see what was coming from Simon and Schuster. The Shots Team and our fellow Crime & Thriller Fiction colleagues met up on a somewhat surreal London evening, to investigate the upcoming 2017 releases from Simon and Schuster Publishing. 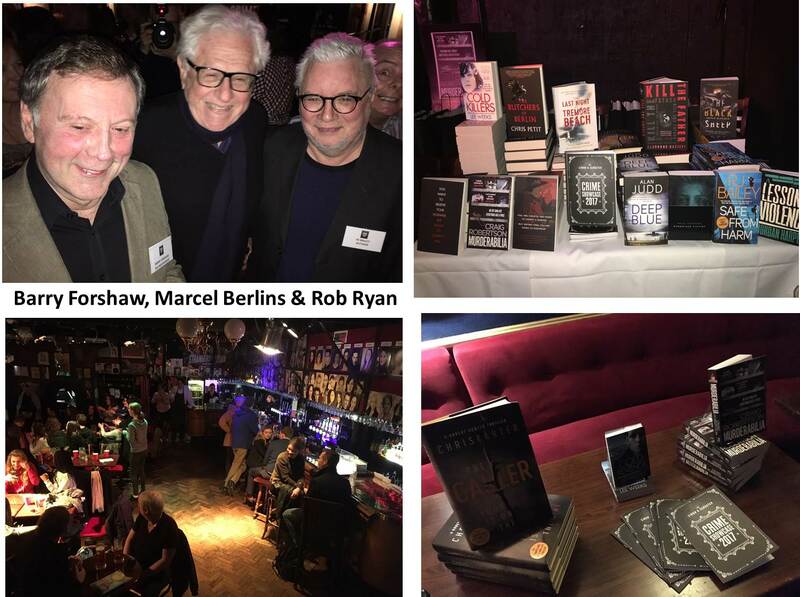 This publishing house hosted their inaugural crime fiction party / showcase in the heart of London’s West End. Earlier that day, there had been a tragic terrorist incident in Westminster that resulted in loss of life and serious injury. Though, stoically as Londoners we all followed that WW2 Mantra ‘Keep Calm and Carry On’. Sometimes the embrace of dark literature is a coping mechanism for managing the more disturbing aspects of our reality, and for not allowing madmen to cloud our world-view of humanity. Simon and Schuster aptly chose London’s Phoenix Artists Club as the venue for their Crime Fiction Showcase, drawing upon their enthusiasm for the genre. 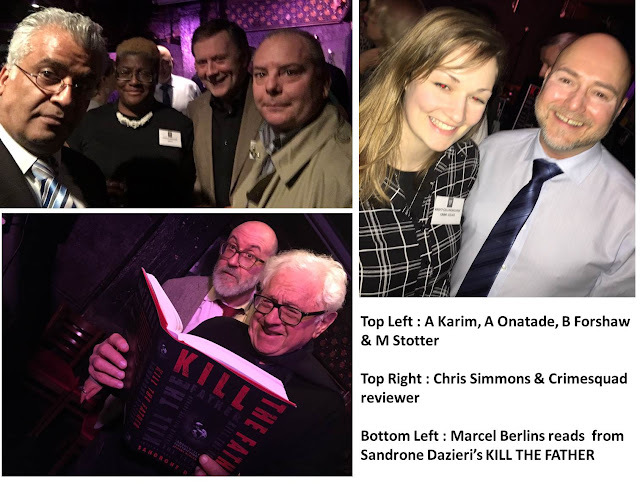 With many of S & S Editorial team, under Publishing Director Jo Dickinson, their authors joined the assembled guests which consisted of book reviewers, booksellers, editors, literary commentators such as Laura Wilson, Marcel Berlins, Barry Forshaw, Chris Simmons, Mike Stotter, Ayo Onatade and many, many others. Diversity is a keyword when it comes to Simon and Schuster’s Crime Fiction list. There had been recent celebration when Chris Carter’s THE CALLER reached No 1 hardcover in the UK. Shots reviewer John Parker read in one-sitting, after realising that the author is unrelated to the creator of The X-Files. 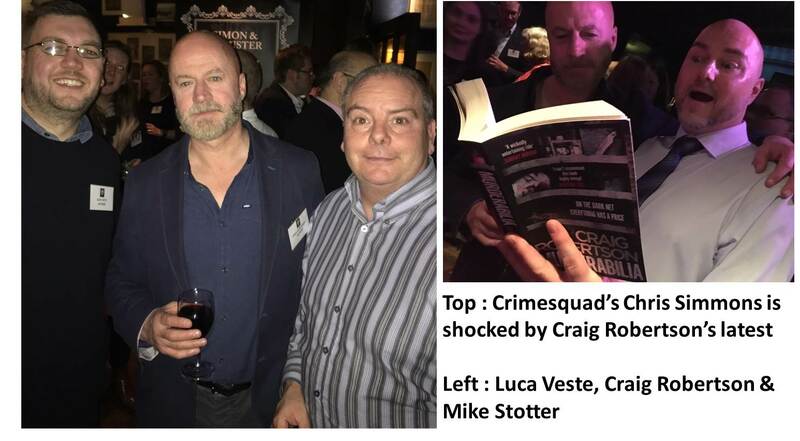 Another author who is gaining much traction is the renowned journalist turned crime-writer, Craig Robertson. 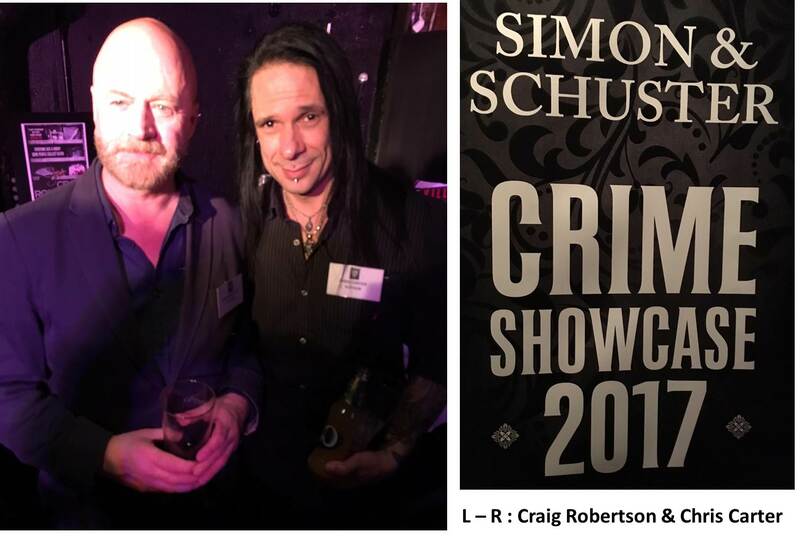 Many of us know of Robertson for his work with Bloody Scotland, as well as being one of the Guests of Honour at last year’s Bouchercon New Orleans [click here to see the Opening Ceremonies, including Craig dressed New Orleans Mardi Gras style]. Shots reviewer Les Hurst wrote about his remarkable Glasgow based peep into the damp floor of the internet MURDERABILIA here. It was also good to see Rob Ryan and his wife who it was revealed are R J Bailey with their remarkable Safe From Harm, which Shots reviewed earlier this year. Also present were authors Lee Weeks, Alan Judd, Andrew Wilson, Chris Petit, Sandrone Dazieri (who had flown in from Italy), as well as Luca Veste, who I discovered is penning his first standalone The Bone Keeper and is planned for release in November. 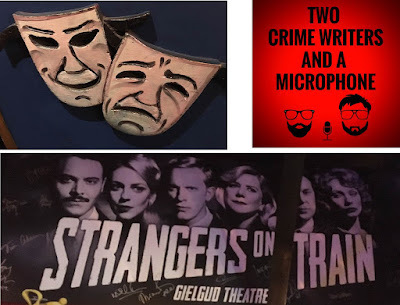 I would urge you to visit the podcast TWO CRIMEWRITERS AND A MICROPHONE which Luca produces in-concert with fellow crime-writer Steve Cavanagh. This podcast is one that always makes me laugh, and can be accessed here. There were goody bags for the reviewers, which included advanced proof copies of upcoming work, of which Sarah Vaughan’s Anatomy of a Scandal is one I am eagerly anticipating, though not scheduled for release until January 2018. So after mingling and sampling the wine and canapes it was soon time for Joanna Dickinson of Simon and Schuster to welcome us all to the party and introduce the assembled authors. 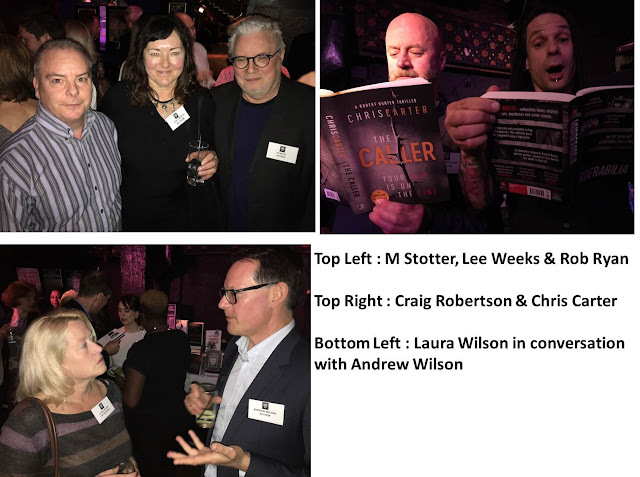 And so it was time to mingle further, with the attendees at the first Simon and Schuster Crime Fiction Party, and we present a selection of photos from the event. Soon it was time to say farewell and thank the S & S Team for throwing a fine party, on what was a dark day in London, made bearable by the comfort of friends who share our enthusiasm for Literature’s darkest Genre, Crime, Mystery and Thriller Fiction.